Tuberculosis (TB) strains with drug resistance (DR-TB) are more difficult to treat than drug-susceptible ones, and threaten global progress towards the targets set by the End TB Strategy of the World Health Organization (WHO). There is thus a critical need for evidence-based policy recommendations on the treatment and care of patients with DR-TB, based on the most recent and comprehensive evidence available. 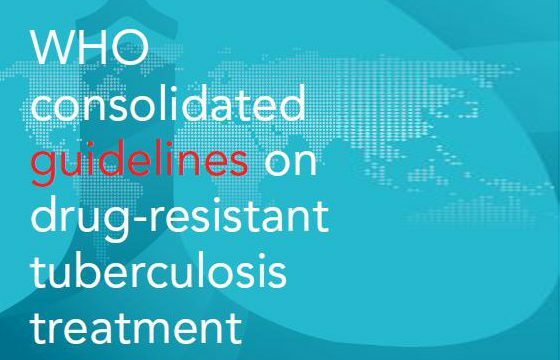 In this regard, the WHO consolidated guidelines on drug-resistant tuberculosis treatment fulfil the mandate of WHO to inform health professionals in Member States on how to improve treatment and care for patients with DR-TB. Between 2011 and 2018, WHO has developed and issued evidence-based policy recommendations on the treatment and care of patients with DR-TB. These policy recommendations have been presented in several WHO documents and their associated annexes, including the WHO treatment guidelines for multidrug- and rifampicin-resistant tuberculosis, 2018 update, issued by WHO in December 2018. The policy recommendations in each of these guidelines have been developed by WHO-convened Guideline Development Groups (GDGs), using the GRADE (Grading of Recommendations, Assessment, Development and Evaluation) approach to summarize the evidence, and formulate policy recommendations and accompanying remarks.